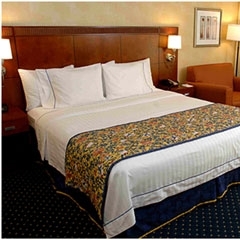 Owners and managers seeking textile services for lodging have a wide range of needs. Not only do you need high-quality bed linens, but you also need towels that can handle heavy and frequent usage. Additionally, you need uniforms for your staff and robes for your guests! Wouldn’t it be great if you could get all of those things from one place? Our hotel linen services specialize in a wide variety of bedroom linen options based on materials and thread count for your desired presentation. Not only can we provide you with the linens and uniforms that you need, but we can also launder them for you! Stop trusting your hotel employees with complicated in-house laundering and get the professional results that you need from an experienced hotel linen service. We work with you to help you manage your inventory, so that you always have just the right number of items on-hand. We understand that not all months are the same for your hotel – your inventory needs are going to change based on the season. So, we take that into our consideration with our hotel linen service, so that you don’t have to pay for items that you’re not going to use. Hotel linen services that you can count on. In many ways, the success of your hotel depends on your linens. More and more hotel guests are discovering that some hotels don’t change sheets and towels regularly, which has fostered suspicion of the entire hospitality industry. Stay above question with a hotel linen service from Republic Master Chefs. We know how to get your linens clean and maintain them to the highest standards for quality and durability. You won’t ever have to worry about whether you have enough clean bedding and bath linen to service all of your guest rooms every day when you work with Republic Master Chefs. If you’re looking to outsource your hotel laundering, contact us today! We can give you a free quote so you can make the best decision for your hospitality business.